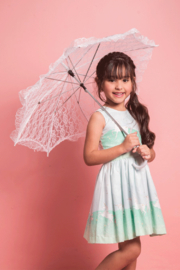 Amanda Unicorn Parade Mint is a beautiful and comfortable dress, made with 100% designer cotton. The neckline is rounded, and you can have it with ruffles and has a wide skirt with a great fall. In the top, it counts with a Gross that contrasts the color tones of the dress. In the smaller sizes, it has a cute strap. Our Mandy Dress isn’t just a dress: they are pieces that are going to be part of your childhood and adventurers. Perfect for a Unicorn Lover!